The examples are also in v7 so you might want to check that out in your install Toufique. You can check if a folder exists already by following some of the code in the "get and update" method then checking to see if the object is null or not. Do you know that Kentico comes with the special application which will provide you with many helpful: API Examples? but i am using Kentico 7. and the answer you provided is checking against Media library i just want check if a folder exist in library. i will create library manually there will be many other folders in my library but my custom web part will check if a folder named exactly as user department exist or not. example: i have 2 departments legal and IT. i have created IT folder but not Legal. so when user loged in with department name "Legal" code should check if any folder exist with same name or not. if not then it should create one. As Brenden said these examples should be included in your Kentico 7 install in the CMSSiteManager if you click the "Support" tab you should see "API Examples" then you navigate to tools > media and in there you will see the "get and update" method that Brenden is talking about. 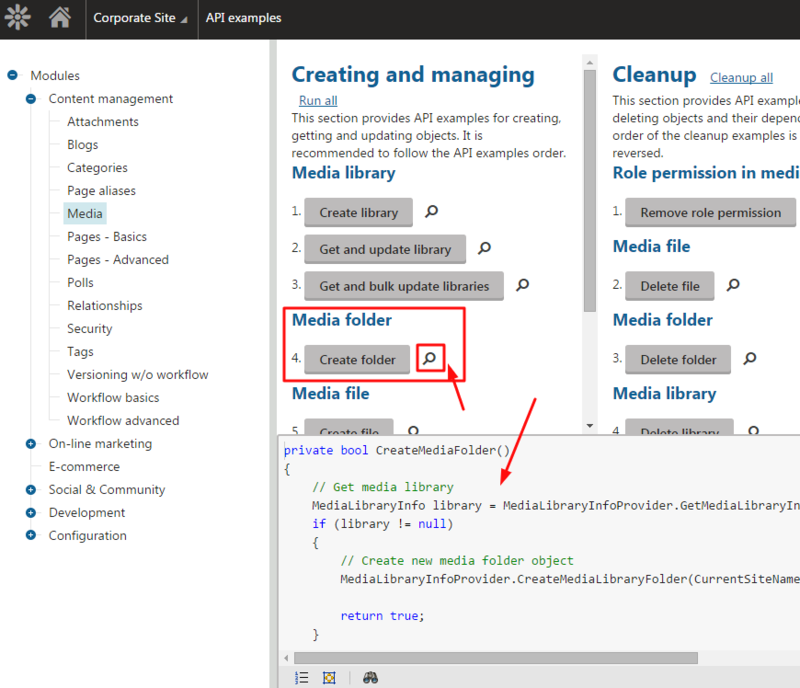 This method will show you how to look up a folder using the API, there is also a create library example that will be perfect for your code for creating the folder should one not exist.